Express Sale Additional 50% Off Clearance! You are here: Home / Great Deals / Express Sale Additional 50% Off Clearance! 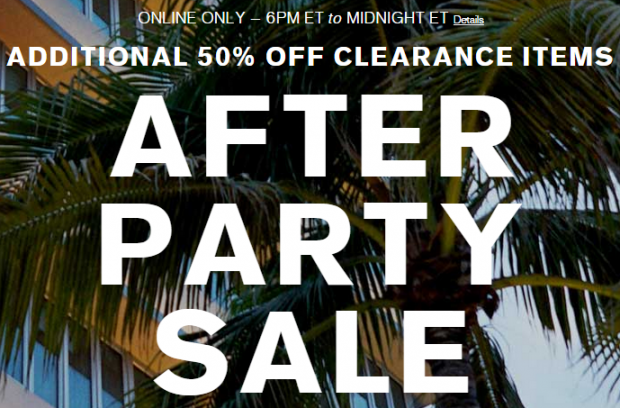 Right now thru midnight EST tonight, 4/5/15 you can get an additional 50% off clearance items at Express! This offer is available on red-priced items ending in $.99. Valid April 5, 2015 from 6:00 pm to 11:59 pm ET on red-priced items ending in $.99. Not valid on previous purchases. Taxes payable after discount is deducted. If you return a portion of your purchase, a portion of the discount will be lost. Cannot be used to purchase Express Gift Cards. Valid online only at express.com. Not valid at Express, Express Men or Express Factory Outlet stores. Associates are not eligible. Free Standard Shipping offer is valid on orders $125 or more placed online at express.com for U.S. or Canada Standard Shipping. No promo code required to redeem free shipping, just select Standard Shipping during checkout. If an expedited shipping method is chosen, Second Day Delivery or Overnight Delivery, the stated shipping and handling fees will apply. If you return a portion of your online purchase, shipping charges will be assessed for the return shipping costs. Sales tax and gift wrap are not included in total minimum purchase requirement calculation. Not valid on previous purchases. Associates are not eligible. Offer is subject to change without notice.